Rumor has it the 30th Legislature will be gaveling out sometime this weekend. The flurry of bills being pushed out in the past two weeks and no meetings scheduled for next week lead us to believe the rumors are true. Highlights this week include the Conference Committee approving the full increment ($997k) for the ADFG budget. HB 76 – Mariculture Loan Funds, a UFA supported bill, passed the Senate on Monday and is now awaiting transmittal to the Governor. Also awaiting transmittal is HB 56 – Comfish Loan Limits which passed the Senate on Wednesday. This is great news as UFA supported all three of these measures. Thanks for hanging in there with us this session and be sure to look for our session recap next week. For those of you starting in salmon openers in the weeks to come, we wish you many deck loads and a safe season. HB 76 – Mariculture Loans – Amended in Senate Finance last Friday – Passed Senate Floor Monday 5/7 final version is SCS CSHB 76(FIN) … awaiting transmittal to Governor. HB 56 – ComFish Loan limits (Ortiz) – Passed Senate Wednesday 5/9… final version is the same as first introduced – awaiting transmittal to Governor. HB 260 – ADFG Electronic license (Saddler) …does not include commercial crew licenses – Passed Senate on 5/1 – final version is CSHB 260(FIN) am… awaiting transmitted to Governor. 2. Legislative meetings of interest for the week of May 14 – There are no meetings scheduled for next week, which may confirm reports that the legislature will be gaveling out by this weekend. You may continue to check the daily House and Senate floor schedules and committee schedule daily, or check on individual bills with the links below. 4. 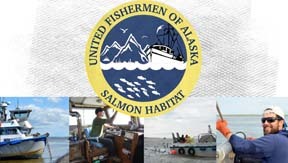 Bills related to fisheries, and others that may be of interest to fishermen…with primary sponsor and current committee. HJR 19 – Arctic Marine Safety Agreements (Lincoln) – Passed House and Senate, awaiting transmittal to the governor. Final version.